A quick view of the most influential metrics in Lake Toxaway. 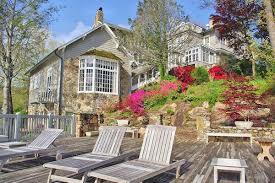 Lake Toxaway real estate for sale through Berkshire Hathway Home Services Meadows Mountain Realty. Located in the mountains of picturesque western North Carolina, Lake Toxaway is the largest private man-made lake in North Carolina. The lake is a popular resort destination for people from across the United States who want a low-key but luxurious lifestyle. The history of the lake began in the late 1890’s when Southern Railway built a rail system from Asheville, NC, through the area. Seeing an opportunity for business, E.H. Jennings developed several resorts along the line, one of which was the Toxaway Inn. In 1902 Lake Toxaway was created to help draw visitors to the inn. Its earthen dam was one of the marvels of the era at 500 feet long, 60 feet tall and 20 feet wide at its top. 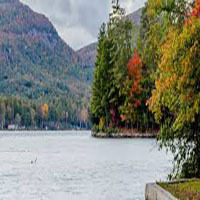 Lake Toxaway became known as the “Switzerland of America” and attracted such notable people as Henry Ford, Thomas Edison, John D. Rockefeller, R.J. Reynolds, Harvey Firestone, James Buchanan Duke, and the Vanderbilt family. On August 13, 1916, after an intense storm which dropped 24 inches of rain within 24 hours, the dam failed and sent the water from Lake Toxaway crashing down the mountainside. Fortunately, there was no loss of life with the one exception of a blind mule. After this event the inn went into decline and was eventually closed, then demolished. In 1960 a group of investors bought the tract that surrounded the original property and began to restore the 640-acre lake. The dam was rebuilt – this time with water level control – and Lake Toxaway was restored to its former glory. Since then Lake Toxaway has developed into a fabulous community with vacation and year-round homes, a place where people can escape the pressures of everyday life. Fishing, boating, skiing, and sailing are popular activities, as well as hiking in the nearby wilderness areas that total more than 10,000 acres. A country club with a challenging, par 71 golf course and Tom Fazio Learning Center, tennis courts, croquet, and club house add to the many recreational possibilities (membership required to enjoy club amenities but not necessary for home ownership). Lake Toxaway is easily accessible from Asheville, NC, Greenville/Spartanburg, SC, and Atlanta, GA. The quaint town of Brevard is only 20 minutes away and offers more dining as well as cultural events. Slightly further afield are Hendersonville, NC, Tryon, NC (with the famous Tryon International Equestrian Center), Cashiers, NC, and Highlands, NC. View our selection of available properties in the Lake Toxaway area. Check out the latest demographic information available for Lake Toxaway. Learn more about schools near Lake Toxaway complete with ratings and contact information. Browse through the top rated businesses in the most popular categories Lake Toxaway has to offer.